As you might know my job is marketing and one of my expertises is tracking and tracing everything, anywhere, anyhow and act upon that data. Sorry focks…it’s part of the job. Recently I went to a meeting of “Platform Innovatie Marketing” and I saw a cool tool there called Clickheat. 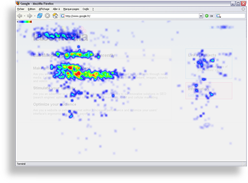 Clickheat visualizes the clicks on your pages by creating a heatmap, you know the kind of images you see on tv when they show a heatimage. Cool! The images are based on the amount and location of the clicks. Ofcourse…by now this blog and my website are running tests as well. I think the tool is definatly worth looking at it. You own a Wii…you own a server…you need email, anytime! What to do? Combine the two parts and create a special webmail application for the Wii. What I did is pretty easy to realize. My webserver is hosting a modified version of NOCC. This a webmail script and what I did it change the templates to make it readable on your tv. Also I automated the logon procedure so you don’t have to enter your username and password, typing on the Wii is not an easy task.